Take your Fold-Out Playsets on the go! Each playset opens up and includes a key feature and a Hot Wheels vehicle! 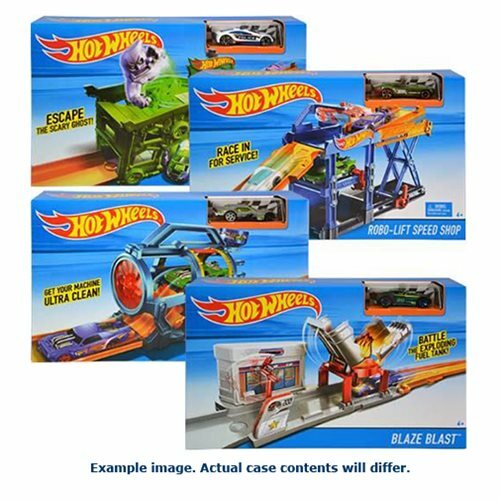 Sets connect to other Hot Wheels track sets (sold separately). Take your Hot Wheels Fold-Out Playset on the go for instant action! Kids will love creating imaginative storylines with the easily recognizable themes and push-around play activity. The various playsets open to reveal a car wash, a garage, or even a haunted house, and each includes a key feature and a Hot Wheels vehicle. These sets connect to other Hot Wheels track sets (sold separately) so kids can collect and connect to create an action highway of even more high-powered adventures! Colors and decorations may vary. Ages 4 and up.